Hello, it's Monday again and time for another idea for Buffalo Stamps and Stuff, my local stamp store. 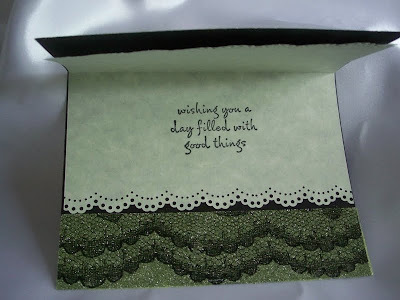 Today's idea is for this gorgeous lace background. 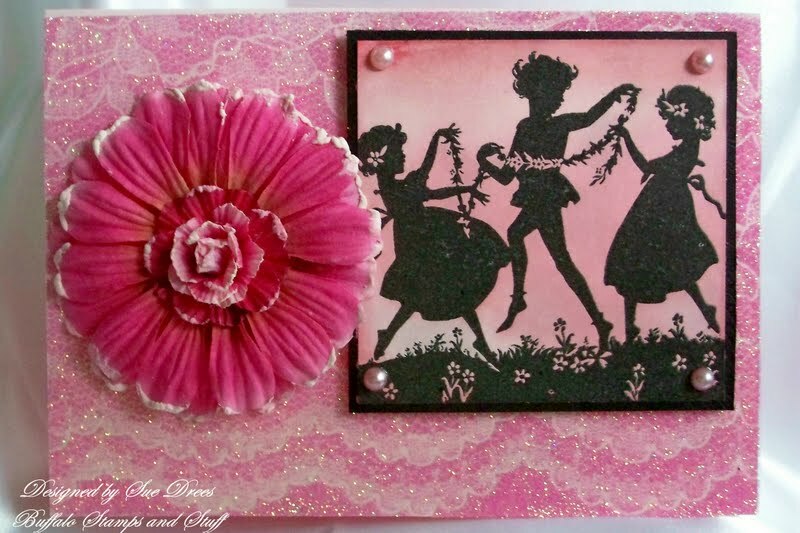 All you need is two sided adhesive paper, a piece of pretty lace and some glitter. You simply cut the two sided adhesive paper to fit the front of your card. Then you place a piece of pretty lace over the adhesive and sprinkle glitter over the entire peice of lace. Shake off excess glitter. Put a piece of copy paper over it and press down lightly to be sure all the adhesive is covered with glitter. Remove the piece of lace (which can be used over and over) and you have this beautiful lace background that sparkles!! I used light pink cardstock for the base card. The glitter is a bright pink from Art Institute. The image is Hero Arts. The pearls are Melissa Frances. The beautiful flower is Prima. 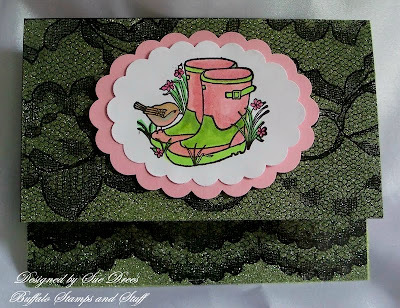 This is the same piece of lace, using black card stock and green glitter. I purchased this piece of bridal lace as a remnant for a dollar. I cut the front of the card at the bottom and did the same technique on the inside of the card for a different look. A close up of the inside. The garden boots are a stamp by Great Impressions. The inside sentiment is Hero Arts. So, pull out a piece of lace and try this, it's so beautiful. 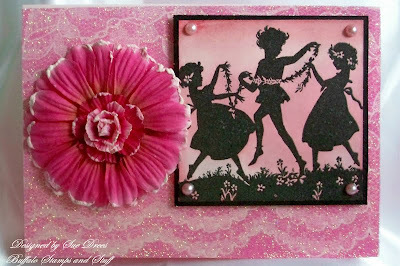 You can use lace trim and make a border, just cut your two sided adhesive paper to fit the lace you have. Love the first card so much! I like this stamp, the image is fantastic!! lovely cards sue, love the stamp of the first card. very romantic card with these lace. Great idea! Will have to try this! Love both cards! Have a great week, my friend!